Choosing the right person for your workplace can be nerve-racking. Making the wrong decision can cost your business in time and money. Whether you’re selecting a young person for work experience, apprenticeship or to hire straight from school, these tips will help you make the right choice. Before you hire, know what skills gaps you need to fill, and how ready and able your business is to train a new person. Be aware of how you could develop a new person in the long term. Does the student’s NCEA credits match skills you need in your business? Does the student’s Vocational pathway show aptitude for your industry? Has your student studied towards a New Zealand certificate while at school? Does your student’s career goals match your needs? Does your student have the personal qualities and attributes you’re looking for? Would your student fit into your workplace’s culture, diversity and environment? 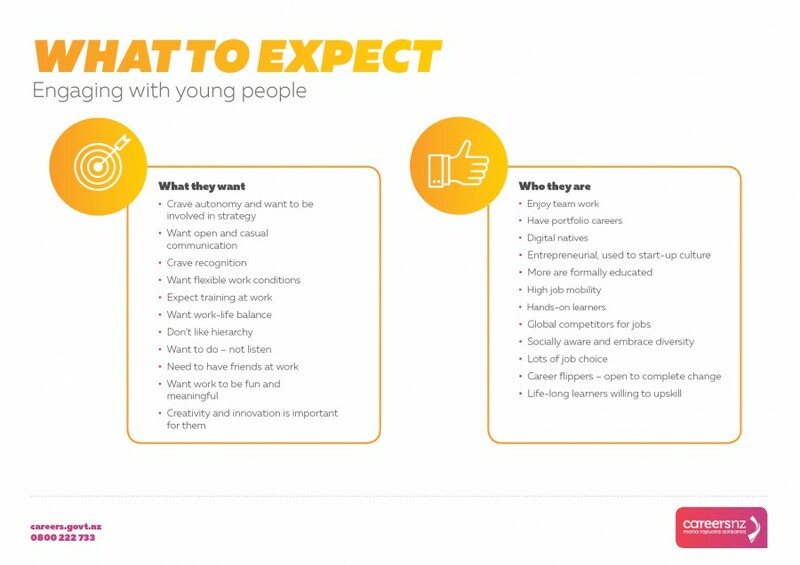 Understanding young people's expectations of work can prevent heartache later on. For example, they may have a different idea on what time to come to work or how to dress then you do. This may be a student’s first attempt at work, so you may need to do some training in work readiness as well as in daily tasks. Students are also used to adults as authoritarian figures at school, so may not ask you questions or ask for help if they're in trouble. Encourage them to open up if they make mistakes or have questions.